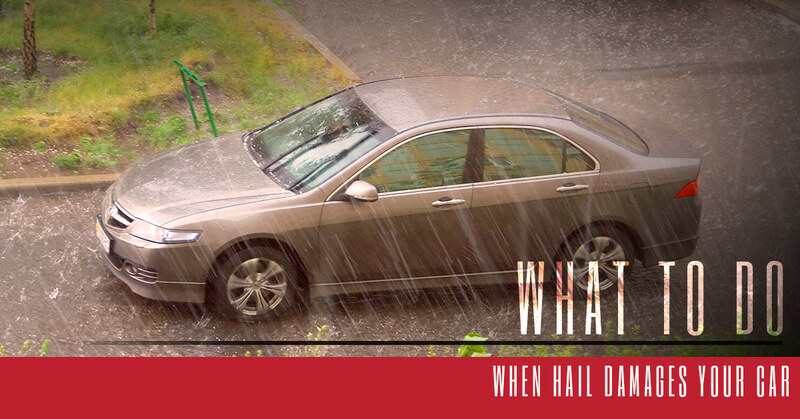 When hail damages your vehicle, it can leave you feeling in a bind. Do you try to touch up the dents yourself? Do you wait on an auto body repair shop for a week while you attempt to manage life without your car? Traditional dent repair options can seem less than ideal, particularly when you are someone who relies on your vehicle for daily transportation. The end result is that many people simply leave their car dented and dinged. Unfortunately, leaving dents in your car not only looks bad, but it also can leave your vehicle’s body weakened and prone to further damage and rust. Repairing dents and dings right away is a must. This is particularly true if a hail storm was the cause of damage as you might only have a narrow window of time in order to receive help from your insurance company for the costs of repairs. Here at AJ’s Dent, we can assist you with quick and affordable dent repair in Denver and surrounding communities. With over 20 years of experience handling hail damage repair and other dent removal services, we can ensure your vehicle is quickly repaired and returned back to you. Check out the following tips from our expert team on what to do the moment hail damages your car. First and foremost, your safety should be your number one priority. If a big hail storm moved through the area and damaged your car, make sure you are 100 percent out of harm’s way. In many cases, one storm is followed by another along the Colorado Front Range. Don’t assume that just because the worst seems to be over it actually is. Check your local news station or weather app to ensure the storms are over and you are no longer in danger’s way. If storms are still occurring, move to a safe location. Your car is one of the worst places to be during a severe storm, which is why it is best to leave your vehicle and take shelter in a sturdy building until the weather has fully passed. Once you are safe and the storms are out of the area, try to contact your insurance provider to find out what coverage you have and how much they will help with repairs. The sooner you contact your insurance company, the better. After a major storm system passes through the area, they often become backed up with calls and will be harder to reach. Take photos of your vehicle and find out exactly what your insurance company needs from you in order to file a claim. Don’t wait around on your insurance company before calling a place for hail repairs. You were probably not the only person who suffered damages to their vehicle. When auto body repair shops are flooded with hail damaged vehicles, it can make the wait time incredibly long. The sooner you schedule repairs, the better chance you have of a fast turnaround time for your vehicle. When you are looking for hail repairs for your vehicle, be sure you take the time to understand exactly how your car will be repaired. Not all dent removal services are the same. Here at AJ’s Dent, we provide paintless dent removal. This unique method is much more effective than traditional repairs which utilize paint to fill in a dent. Instead of simply filling in the area, we actually pull out the dent and return your vehicle’s body back to normal without damaging the paint. You should also inquire about the time your vehicle will be in the shop and what services the company provides for you. For example, will they pick your vehicle up and return it? Will they offer you a rental car while you wait? Finally, once the service is complete, take some time to inspect your vehicle. You should be 100 percent satisfied with the work that was completed. Here at AJ’s Dent, we provide our customers with a lifetime warranty on our work. We stand behind what we do because we utilize the best dent removal methods. If you were recently impacted by a hail storm, please reach out to our team to schedule dent repairs. Denver is our home base, but we offer services from Colorado Springs to Fort Collins and the communities in between. Reach out today to learn more. ©2018 AJ's Dent - Do not copy. All rights reserved.